Office Web Apps are now available for general public on Windows Live. The initial release is available to Windows Live customers in the USA, Canada, Great Britain and Ireland only. Later on by next week when MS Office 2010 is released, this will be extended to all customers. Also, important news is that Office Web Apps will be available for free on Windows Live for general public starting two weeks from now! 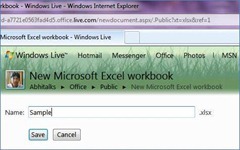 When you log in to Windows Live (or SkyDrive), you see a new link called “New”, clicking which drops down to show a menu to create new Word, Excel, PowerPoint and OneNote documents. There are quick icons on the right too to do the same (but these icons are not visible always). You can also create/open a document in Office 2010 and then “Send to Web” using the “Share” option on “BackStage”, which will publish it to your SkyDrive account on Windows Live. The documents on SkyDrive can then be marked private or shared or public depending on how you want to share them. Co-Authoring is a new feature in Office 2010 and extends to Office Web Apps as well. This is in direct competition to share documents on Google Docs where multiple users can work on the same document from different places. But Microsoft Office Web Apps are far ahead! Windows Live asks for the filename to be given to the new document (notice that extension and hence version cannot be changed). Office Web Apps are limited to Office 2010 documents, however these documents are backward compatible with Office 2003 and Office 2007 by using document convertors. Notice how polished the interface is and how closely it resembles the Desktop version of Office 2010 including the “Ribbon Bar” and the “Backstage”! The application is very responsive and rightly so because it is based on Silverlight. Try looking at the source in Internet Explorer or use the Development Tools to inspect the DOM. You will find it very interesting and informative. The Excel Web App feels just like its desktop counterpart. Arrow keys work exactly the same, Double-click on column separator and column-autofit works exactly the same, F2 to edit a cell works and so do all keyboard shortcuts. Try entering a formula (although the sophisticated formula wizard is absent), but the auto-suggest works like a charm. (see the above screenshot). Notice the bottom-right corner where you will see how many people including you are currently working on this document. You may pull out presence information if you have Microsoft Live Communicator installed. Notice the above screenshot with “BackStage” open. There is no “Save” option! The documents are saved automatically! It seems great as of now. Surely a Google Docs killer in my opinion. Do give it a try at least. You have to use it to believe it. Okay, if you have seen the announcement, you must be aware that is open only for a few locations (USA, Canada, Great Britain and Ireland). It will still take some time before it opens out to all. If you have Office 2010 Beta or Trial version installed then you can start right away by sending your document to Web using the “Share” option on “BackStage”. This will add Office Web Apps to your live account and you can start creating and sharing your documents as shown in above screenshots. So, if you haven’t already tasted it, do it now!